While the universe seems to be built in an orderly manner, it might that its imperfections, breakages in order, and even disorder are partly the key to its beauty and complexity. In a perfectly ordered universe, the amount of matter and antimatter would have been the same; but, if the amount had really been the same at the beginning of the universe, matter and antimatter would have annihilated each other and we would have no universe. Asymmetry is often seen in quantum physics. Many seemingly symmetric forms in the living natural world, such as sea shells generally only coil in one particular direction according to species. This can be traced back to asymmetry in the chemistry of life. Most of the molecules of life can be exist as mirror images but living organisms almost exclusively utilize the left handed configuration for amino acids and the right handed configuration for sugars belonging to DNA or RNA. These observations about the universe as a whole may have direct application to our health and how we live our lives. While many of us crave and protect order in our life, sometimes too much order is not good. 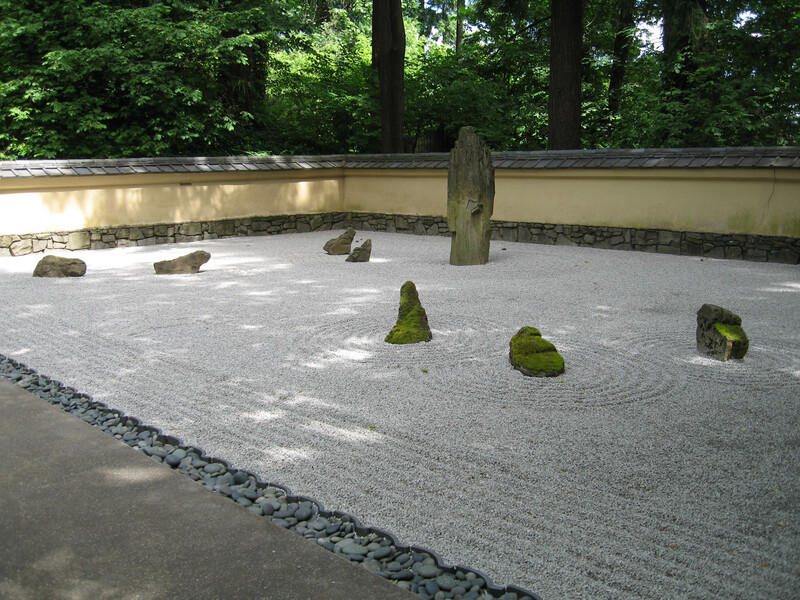 A Zen garden never has its stones perfectly spread equidistant from each other. The beauty of the natural world comes from a sort of dynamic disorder. Physical and mental health may not be a matter of perfect order and balance but is instead produced by a balanced chaos. About a month ago a co-worker died in his sleep. He worked on the West coast while I live in Atlanta so I only knew him from extended software design sessions in conference calls and Live Meetings. I never heard the official reason for his death but someone sent an email with a link to his last Twitter postings. Every posting was about how much he had cycled. Every day or every other there was an entry – 60 kilometers, 40 kilometers, 80 kilometers. One would have thought he would have been in the best of health, the most unlikely of people to die unexpectedly in their sleep. Actually, however, the sudden death of people who engage in large volumes of aerobic exercise is not so uncommon. One of the more well-known recent examples was the case of Micah True, the almost mythological ultra-marathoner of Christopher McDougall’s book Born to Run, who died while on a run in the Gila Wilderness from what was thought to be a cardiac dysrhythmia. When we measure the pulse of a person in beats per minute, it turns out that heart rate is really just a sum of what the heart is doing over time. In other words, if we measure a person’s heart rate for a minute, we might find that the heart beat 7 times in the first 10 seconds, 10 times in the next 10 seconds, 8 times in the next, 12 in the next, and so on. Here’s a trick question. Is the heart of a person with the more regular heart beat healthier than that of a person with a less regular beat? You might be surprised at the answer. The regular metronome-like heart is typically the heart of a sick person. The mystery of the death of well-trained athletes and the paradox of the regular heat beat led Irving Dardik to a theory that the heavy aerobic training was actually training the heart to beat in a more regular fashion. In other words, it was reducing the natural variability in the heart that is the key to health. Dardik devised new training methods based on his theories. Instead of constant exercise at one pace, the training methods emphasize variability with constant changes of pace, effort mixed with recovery. Dardik believes a wave principle is at work in living organisms but the wave is complex with a lot of variability. Health is produced by synchronizing the waves from the lowest to the highest levels in the body. Inducing greater variability in the heart actually promotes health in the entire body. The causes of disease as they’re perceived today is a target, a molecule, a gene, a material substance, a thing that is responsible, that is unstable, you know, a genetic instability, a mutation. Where I’ve come from in my understanding based on my experience, not only with working in the cardiovascular arena in medicine, but also working with the Olympics as head of sports medicine, sport science there, and looking at the bodies and health, at the body’s rhythms and recognize that all motion in a living organism, from a bacterium right all the way up to an elephant’s tusk, all motion, all change is rhythmic. It’s cycles of motion. At every scale the whole body’s behaviors… my behaviors, I exercise and I recover in a cycle. I wake up and go to sleep. We know that. Anxious and then relax. But the heart is beating also, and the chemicals are oscillating and every molecule, every hormone is secreted in a pulsatile way, going right down to the DNA, which we know is a double helix and it’s contracting and relaxing. They call it grieving. So what I figured out is how to orchestrate the body’s rhythms to resynchronize the orchestra, the chemical, biochemical oscillations in order to create health. Coming from that direction rather than just having a war on disease and trying to kill a target, how do I resynchronize the collective? The billions and trillions of interactions that they can all become orchestrated in a pattern designed for health? While I have done my share of volume aerobic training, even before reading about Dardik, I had begun incorporating more variability into my exercise routines. Currently I combine high intensity interval training, medium runs with varying paces, and long walks. I do low volume heavy weights with dead lifts as the main focus, a high repetition workout with light dumbbells, and body weight exercises. Four or five days a week I try to do some meridian stretching routines created by Bob Cooley. I don’t follow any rigid pattern but pick and choose from the above types of workouts according to how I feel with rest days when I do almost nothing. Dardik’s theories could be extended well beyond physical exercise into other aspect of our lives. Their applicability to diet is most obvious. Constant consumption of the same food, even if it is generally healthy, probably isn’t the best approach. We need different types of vegetables, fruits, grains, and maybe even some meat to maximize the chances that we are getting all of the nutrients our bodies need. A diverse diet not only is healthier but also is easier to maintain over time. Most of us spend too much of our lives working in the same jobs, living in the same places, meeting the same people, eating at the same restaurants, and exposing ourselves to the same ideas. We would do well to shake up our life a bit more. If we don’t read, we should start. If we only read fiction, we should read some non-fiction or vice versa. We should learn a new language or at least travel to a place where a different language is spoken. If we can’t afford to travel, we should seek out opportunities to meet new types of people where we live. We all (myself included) fall into ruts. Death itself is ultimate, unchanging rut. Dardik carries his ideas into a Superwave Theory that encompasses not just living organisms but the physical universe at both the macro and micro levels. “Dardik’s Superwave Theory says that nature is all waves, right down to regularly pulsating DNA and all the way up to pulsating galaxies and the birth of the universe.” (1). The Dardik universe is one of waves nested within waves in a fractal way with each wave creating a resonance with the other waves at higher, lower, or the same level. Dardik even believes his Superwave Theory can be used to make cold fusion a reality. While Dardik has been a controversial figure and his ideas for cold fusion may not eventually work out, his insights about waves and order may still provide fruitful avenues for future research in both medicine and the physical sciences. 1- Lewin, Roger. Maker Waves: Irving Dardik and his Superwave Principle. Rodale Press. 2005, p 9. This entry was posted in Cold fusion, Randomness, Running, Waves. Bookmark the permalink. Loved this post, Jim. This is one I can totally understand and ride behind. I love the waves of life, it is what makes it feel not only mystical but alive. Thanks for sharing something I probably would not have been exposed to. I am going to read about Cold Fusion because I cannot believe that a man who is dead on in this area could be too far off in any area. Very few people begin their hypothesis with the human body. I think that is an important place to start. Thanks again for your blog. By the way, when doing your exercise don’t forget the part that balances is periods of stillness without movement or effort. Also, do not forget that every theory that seemed to simple or usable was thrown away by those who feared it could happen. Some on this planet are invested in the status quo and some of us know that it is impossible for the human mind not to change and create. I read a little about Cold Fusion and I believe that it is possible to have an energy source that is FREE and easy to acquire. Look how many people it would put out of business, look how many people it would save. Do the math. Love it. I still not sure about cold fusion but I wouldn’t be surprised to find out we can make it work. I need to work some more on the still periods but I sometimes do some yoga breathing followed by either chanting or meditation. I feel better when I do this so I should be making it more a part of what I do.